Ever see a TIE fighter pilot up close? Striking artwork inspired by A New Hope. Measures 28-inches tall x 23-inches wide. Have you ever seen a TIE fighter pilot up close and personal? 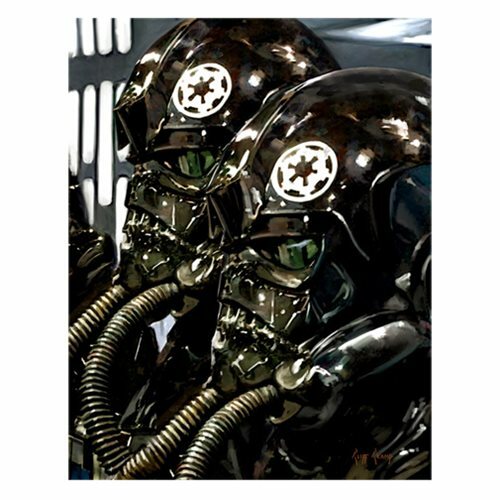 You have now in this striking Star Wars TIE Fighter Pilots by Cliff Cramp Canvas Giclee Art Print! TIE Fighter Pilots by Cliff Cramp features artwork inspired by A New Hope. An unframed limited edition of only 125 hand-numbered pieces, it measures 28-inches tall x 23-inches wide. Each canvas print is signed by artist Cliff Cramp and comes with a certificate of authenticity.